The parking industry is realizing that advances in technology and society affect the current thinking related to mobility and parking. These changes raise questions: What will the future hold? Will parking demands increase, decrease or simply change? What will become of our parking structures? The service life of parking structures, as designed today, is typically 50 to 75 years. As such, they will continue to be fixtures of our community's urban landscape for years to come. However, we are realizing that over the next half century our mobility options and preferences are going to change, and the needs of the urban community are going to change. The last thing anyone needs is to build a structure that will be obsolete or severely underutilized in the near future. But with sustainable design in mind, what if parking structures could be designed to not only handle our current needs, but also to adapt to better meet the evolving needs of communities in the future? What if we could “future-proof” the parking structures of today and design them to become a community mobility hub, event center or some other valuable type of site? Can this be done, physically and economically, in new parking structure design? I believe it can be accomplished by integrating and providing adaptable building architecture to enable future reuse of the existing structure. Some might argue that it would be simpler and less costly to demolish the existing parking structure and replace it with a new building more suitable for the new use. But in some circumstances, and for many owners taking a long-term view, this may not be the most environmentally responsible or cost-effective choice. How do we go about doing this in a creative and economical way? What should we consider today to allow parking structures to be multifunctional and adaptable in the future? First, let’s define the design challenge. Parking structures are unique building types. They are typically open to the environment and are designed to be storage facilities (Group S Occupancy) and not conditioned, occupied spaces. Parking structure story heights are not suitable for most commercial office/retail or residential use, and they require sloped floors to facilitate vehicular circulation between parking levels and drainage. Also, HAVC systems are not provided for parking floor areas. They are typically more horizontal than vertical in configuration. 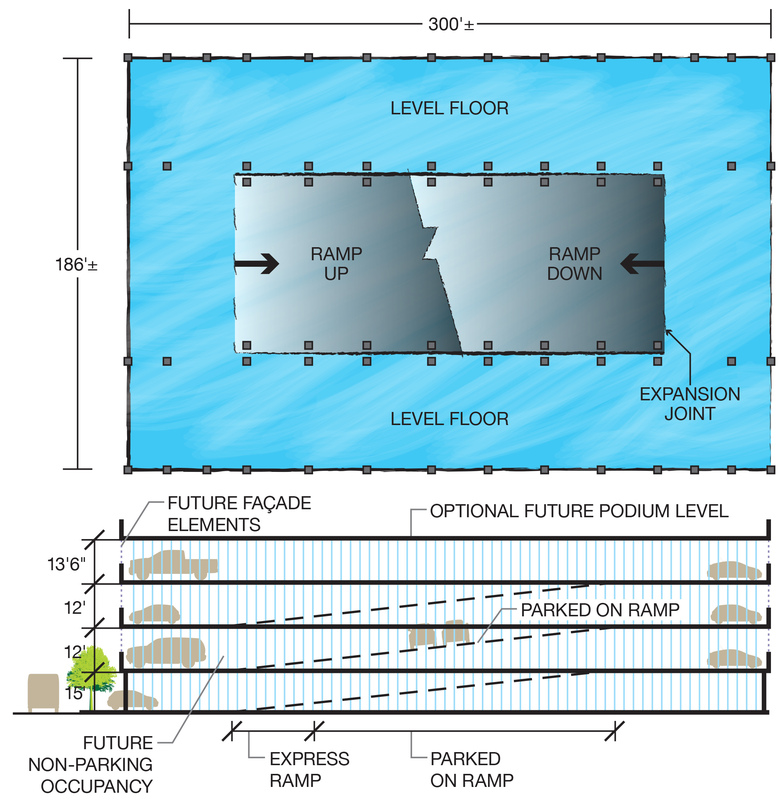 The primary focus of parking structure design has been to efficiently move and store cars. In contrast, buildings for nonparking uses focus on making the occupied space safe, habitable, appealing and accessible for people. So, what can be done differently when planning for the parking structures of the future? Increase story heights. We can make the height of the first story a minimum of 15 feet and the height of typical upper stories 12 feet. These heights provide higher clear heights of 12± feet for ground-level commercial/retail use and 9± feet for office, community meeting or residential use. Design the floor framing to allow for the ramped parking bay to be more readily demolished. Include a 30± foot-wide light well between parking bays to provide space for construction of additional elevator and stair cores and flat floor construction for corridors within the interior of the building footprint. Locate perimeter stair and elevator cores that serve the parking structure outboard to the floor plate. This will allow for easier demolition of these elements if they don't adequately serve the alternate use. Building columns, walls and foundations could be designed to accept vertical expansion and the addition of a podium level for a public plaza recreational space or a one- or two-story light-framed building structure. Design floor framing for additional load-carrying capacity by including provision for adding columns and beams to reduce beam and slab spans or supplement slab and beam reinforcement to support additional floor loads. Provisions such as these could be considered in the design of new parking structures to enable future adaptability for nonparking uses, allowing those structures to achieve a greater useful lifespan. Parksmart certification recognizes the importance of this type of future-oriented thinking in increasing sustainability and lowering environmental impact. Projects embracing these design strategies are encouraged to seek innovation points within the Parksmart rating system when working toward certification. Plan: Two parking bays with internal non-parked on express ramp. Graphic by Sanjay Pandya.